Since the beginning of the Texas Frontier, leather products provided a booming industry in Nocona. 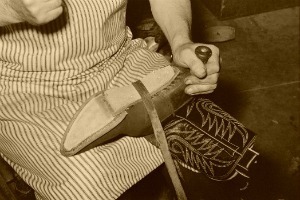 Cowboys needed boots, saddles, whips and other gear of their trade, and in 1879 H. J. Justin started making boots in Spanish Fort to supply cattle drovers heading north on the Chisholm Trail. When the railroad moved to Nocona, so did he, doing business as H.J. Justin and Sons. After his death, his sons moved to Fort Worth and started Justin Boot Company. 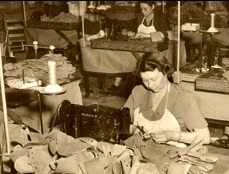 Nocona Leathergoods was established in 1926, making leather purses, wallets and other small leather products. In 1932 they reorganized under the name of Nokona and began making baseball gloves and footballs in 1934. Nokona baseball gloves are still produced in Nocona by the same company, now called Nocona Athletic Goods. Each glove is carefully cut, stamped, stitched, and laced by hand. Factory tours, available Monday through Friday, offer a unique glimpse into this aspect of Nocona craftsmanship, the only ball glove handcrafted and 100% made in the USA (www.nokona.com).